Car not charging,..DC/DC converter failure. not what we expected. Ok, well there's your problem. Anyway, strap in, this is going to be long. So to begin with about a month and a half ago we went to go to the shops in our iMiEV and as we turned out of our street, we noted that the car had not charged fully, and that we had the red 12v battery warning light as well as the orange exclamation mark high voltage warning light. Hmm, thats weird, so we went back home, and did some troubleshooting. We first plugged it back in, and it did not charge, we then tried our charger from our Outlander, and still no dice. Hmm, ok. We then checked the battery, all good, but it did not appear to be charging when the car was on. Hmmm. We then tried to get the error codes from the car, and Mitsubishi said, "yeah, nah, you cannot do that". We tried different software and hardware, but nothing would allow us to read the error codes. Hmmm, ok, guess we will need to take it to the local dealer to get the codes, as they seam to be proprietary, which is very annoying, error codes should be available to the owner, but nup, Mitsubishi ain't got time for that. Ok, we went to the dealers, I told them the symptoms and the research we had done. 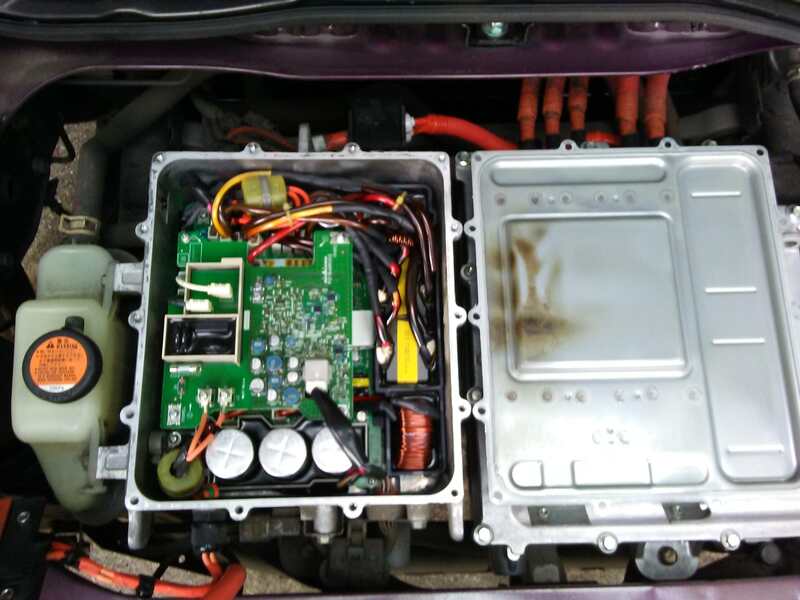 I told them that based on the symptoms we think the issue is the DC/DC converter as other iMiEV owners with the same symptoms found the issue was the DC/DC converter. I asked them to get the error codes for us, at our cost of course. Two days later, after they said they were having difficulty working out what was wrong, they said that the issue is the Battery ECU, and that it costs $1300AUD to replace it. We knew that the DC/DC converter had a cost in the vicinity of $4000AUD, as we were pleasantly surprised that it was going to cost only $1300AUD. I asked them if they were sure that that was the problem, and I was assured it was, so we agreed to have the Battery ECU replaced. Well, no ETA was given, and we expected it would be a few weeks. After a few weeks we went to the dealer, and they said that they were originally going to get the Battery ECU in August 2018, but now will have it on June 6th. Phew, August would have sucked. I still have a gut feel that it was the DC/DC converter, but without the benefit of diagnostics from the MUT III, it was hard to argue with them. So this past Friday we went to see how things were going, only to find out that they have the Battery ECU, have replaced it, and it did not fix the issue. They now believe the issue is the DC/DC converter. Well **** me, I told them that in the beginning. We argued that we should not have to pay for the Battery ECU, but they refused to accept responsibility. I then said to take the Battery ECU out, and put in the original one. "Oh, that will cost you 5 hours of labour at $170AUD an our ($850AUD) and it won't be ready until next week sometime". Fuming, we said to leave the ECU in, we'll pay for it, but we want the error codes and the original part. We took the car home this morning, and began the investigation ourselves. So we made the car High Voltage safe, and removed the cover of the DC/DC converter. The DC/DC converter contains two boards, the top one I believe is the AC charger input, while the bottom one is the DC/DC converter. The AC charger connects to the DC/DC converter, where the DC is converted to 330v (?) for the traction battery, and 12v for the axillary battery. The top board looked ok, and both fuses on the top board were intact, and checked with a multimeter. 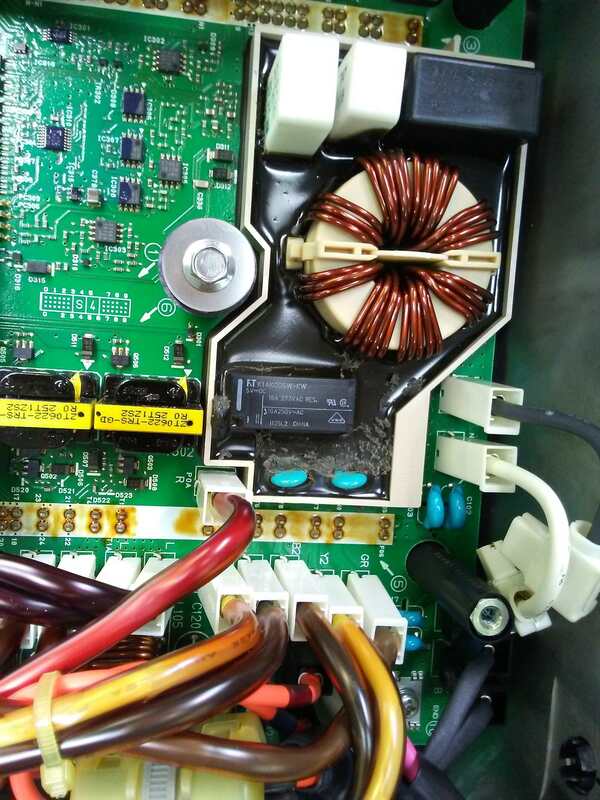 So we removed the top board, and low and behold there is some soot on a component of the bottom board. Further investigation found that it is an upright board where the soot originated from, which contains two surface mount resistors. One of these had popped its top, and spewed its remains on the black resin casing below it. Houston we have found our problem. So, what to do now. We have a few options, first of all I may be able to replace the expired resistor, but I need to work out what the resistance of that resistor was. This is also a difficult job due to the placement of the resistor, so I have to be careful to not damage other components in the process. Option 2 is to work out which board contains the VIN locking (extortion coding), is it the top board, or the bottom board. The top board does appear to contain a chip, which may be the MCU for the board, however tomorrow I plan to remove the bottom board and see if I can locate any chips that may be a MCU on that one. If the extortion coded MCU is on the top board only, then we may get away with replacing the bottom board from a wrecked iMiEV. So at this point we are still considering our options, I think I may attempt a repair first. After-all, I cannot make it any worse, just need to work out what resistance the resistor had (it has loads of resistance at the moment ). The moral of the story, go with your gut, not the dealer, as they will replace component after component, rather than actually investigate the actual cause, and they will raid your bank account in the process. Re: Car not charging,..DC/DC converter failure. not what we expected. sorry to hear of your troubles and such poor service and treatment by the stealer. i bought a mut-clone scanner tool, the Carsoft i909, which will read the DTCs. It won't let you re-do VINs for ECU changeout, but is very handy to get the trouble codes and data. Is that black potting compound like a flexible rubber, or a solid epoxy? electronpusher, so sorry to see you jerked around by the Mitsubishi dealer. Their mis-diagnosis cost you time and money and their refusal to do right by you reflects horribly on not only the dealership but Mitsubishi Australia Ltd., as well as the Mitsubishi Corporation - a sure way of stopping future product sales to you, the customer! 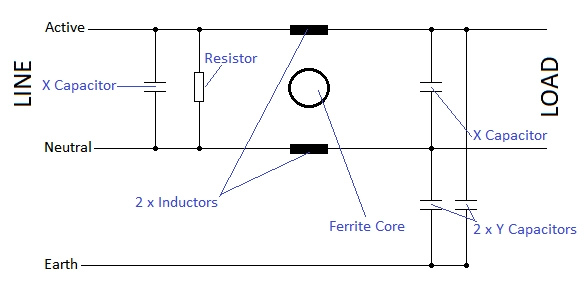 Regarding your burned-out resistor - a resistor is rarely the cause of a problem but, especially in power circuits, it often acts as a fuse when, for example, a downstream capacitor shorts out. IIRC, kiev discussed this elsewhere on this forum. 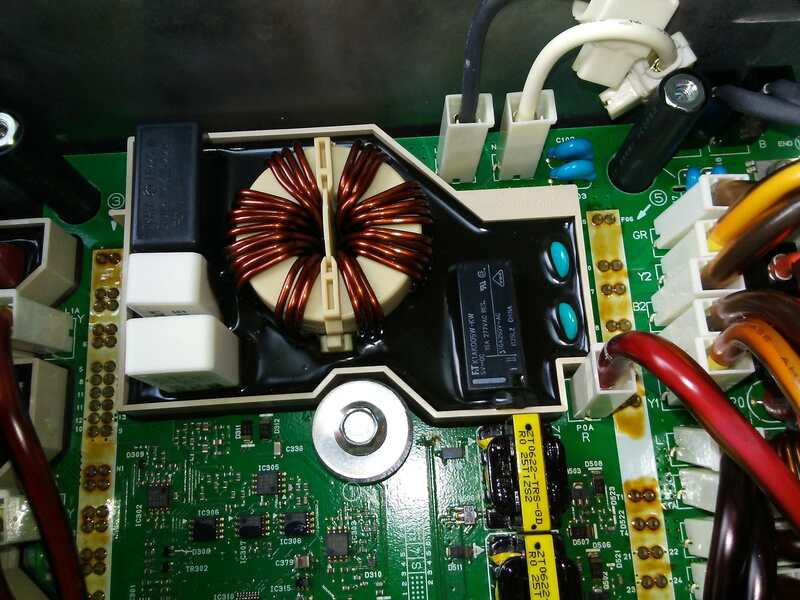 electronpusher, thank you for your discussion and photo, wish you well in further diagnosing and fixing the problem, and do let us know how things progress. Good luck! I think board with the blown resistor has been bonded to the water cooling layer of the DC/DC Converter, it does not appear to want to budge, and I do not want to break it. Possibly it could be attached from underneath, but it does not appear so. We drained the coolant, and then removed the DC/DC Converter from the car. On the bottom side of the DC/DC Converter is another cover, which we removed. On this side is another board, which has some high voltage components on it. We have not attempted to remove this board as we need to be able to drive the car in a few weeks to our new home shortly. So for the time being, we will be putting everything back together tomorrow, so that we can drive it to our new home. It has enough energy left in the battery to make that drive, and it still drives just fine. Once there, it will need to sit for a few months as we have stuff we need to do to the house, so this is where this saga is going to end for the moment. We have not yet decided on how we are going to proceed, as we are considering our options. We may end up getting a second hand DC/DC Converter, and swapping out the top board from our car into the second hand part. I have a feeling that the IC on the top board is where the VIN Locking of the part is occurring, as it was the part that was connected to the cars CAN BUS. We may get away with simply swapping that board over to the second hand part, which will be wonderful news for all the other people out there with the same problem. We may end up writing it off financially, and sell for parts. 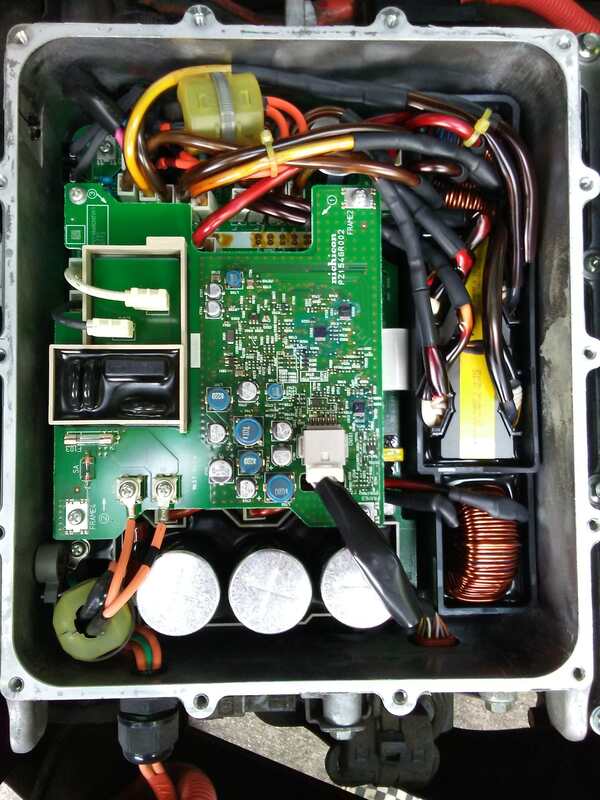 The other option may be importing an iMiEV from Japan for parts, and simply swapping out the Battery MCU, Motor Controller, DC/DC Converter and cars ECU, which are all the VIN locked components. But we don't know just what we are going to do at this point. So if anyone knows someone wrecking an iMiEV who would be happy to part with the DC/DC Converter, or if anyone has any advice on how we could import the part from Japan from a wrecked iMiEV over there, please let us know. Looks like a different layout used in the US 2012 versions--i opened mine up to read that resistor value for you and my unit doesn't have that vertical board such as yours. There was scorch marks under my cover where the inductors and transformer wires got warm and off gassed the plastic tubing. Here is the AC input and CAN buss connection of the top board with physical barrier isolation. The potted doghouse is the surge arrest and suppresion for the AC input. Flipped over the top board to see the processor, IC701 marked as R5F71424FPV, likely a Renesas microcontroller. Nothing else would likely store the VIN on the bottom board, so swapping the bottom board and keeping the top board would probably work for you. Here on the bottom board is the EMI filter and AC input relay doghouse with flexible rubber potting which can be easily removed with a spudger stick or bamboo chop stick whittled to a flat blade on one end and a pencil sharpener on the other. The bottom board is held in with 10 fasteners that are numbered and have direction arrows for the removal or installation sequence. It does not require de-soldering to remove the board. The filter surge capacitor is marked OKAYA LE225, 310Vac X2, which would be across the mains before the coil. The bigger white ceramic resistor is marked P102K TAM 4.7 Ohm J, rated for 157 degrees C. Couldn't read the smaller one. Another view rotated to read relay markings, 5Vdc coil with 250VAC 16Amp contacts. Maybe there is a board buried under where the two blue caps are sticking up? Your board may be a snubber circuit for the relay coil, or a circuit to bootstrap power for the relay from the AC mains. The TCCH/Elcon chargers use a bootstrap circuit and have a failure mode where the bypass resistors will blow such as yours did. The value in those chargers is 75R created by two 150R 5W resistors in parallel. There are some great fellows down under, e.g. Coulomb on the AUEV association forum, who would probably help you fix it. Does your car have DC quick charge, level 3 charge port? i posted how to close the relays to get direct access to the pack + and - thru the Chademo port. Even if you don't, there are other ways to push electrons back into the pack that bypass the onboard charger. Last edited by kiev on Sun Jul 15, 2018 6:16 am, edited 1 time in total. kiev wrote: Maybe there is a board buried under where the two blue caps are sticking up? Actually, those "caps" are a slightly different blue to the others. I suspect that these are NTCs (negative temperature coefficient resistors), which are often used for soft starting / pre-charge. Their resistance starts high, they quickly get hot, and their resistance then drops dramatically. Things may be a little different between the American and Australian models due to the difference in mains voltage (120 V versus 240 V, though we sometimes pretend that ours is 230 V). The Japanese models would presumably expect 100-120 V mains, while European models expect 220-240 V. Since the US and Japanese markets are presumably much larger than the others, they might use the daughter board to house something special for the less common Euro/Australian markets. The daughter board might have held more NTCs in series, or they might use NTCs of different characteristics. There could well be other changes to accommodate the roughly 2:1 difference in expected mains voltage. I'm guessing that this part of the circuit is mains related, with a 250 V relay nearby. I don't know this charger/converter as yet, so I could be way off base. Wow, talk about a supportive community! Thanks Kiev, coulomb, electronpusher and Joe! Do ya think that the extra insulating sleeve of clear vinyl that 'browned out' is still a good thing, or would removing it allow for better wire cooling and prevent future full failure/ short circuit? Just popping the zip ties could be a start to prevent heat buildup! Here's a link to Kiev's post about activating the CHAdeMO contactors for HV Pack access at the DCFC port. Howdy Mike, welcome to the miev forum. I'm guessing that this part of the circuit is mains related, with a 250 V relay nearby. I am thinking the same thing. The iMiEV does not have a proper EVSE so to speak, it is pretty much a cable that goes from the 240V socket to the DC/DC Converter. Now the iMiEV charge cable lacking the EVSE would dump any surge from the 240V socket into the DC/DC Converter, rather than kill the EVSE. This may explain the large number of iMiEV's that are having their DC/DC Converters killed. If/when we fix ours, I think we will dump the iMiEV charge cable, and use the EVSE that we have for our Outlander. So the next question is, will a Japanese DC/DC Converter work for our car (with the top board swapped over), or do we need to source one from a 240V friendly country such as EU or UK? I did note that ours had the abbreviation GBR on top of the DC/DC Converter, this may mean it was a converter for the UK market. It does however also have V110 written on it, now is this refer to voltage, or version number? Thanks Kiev for all the useful information. It is interesting the different components on your DC/DC Converter compared to ours. For normal charging i-MiEV is connected to either a standard 100-volt or 200-volt domestic outlet using the charging cables supplied with the vehicle. So based on that, I think we should ok to source the DC/DC Converter from Japan. Hopefully the VIN Locking is occurring on the top board, and hopefully it is not damaged. Thanks for all the wonderful knowledge from you all.